Rock on, Cosmos Gaming fans! Tonight I’ll be reviewing Brutal Legend, that Heavy Metal RPG starring Jack Black, Ozzy Osbourne, and a few other rock gods. Crafted in controversy, born from strife, this Heavy Metal-themed RPG/RTS/music rhythm game is like your favorite rock ballad… played by you. Therefore, there will be mistakes, a little bit of learning, but you will have the BEST time of your fanboy LIFE! Except when you drive your car off yet another cliff, come to a crashing halt on a piece of scenery, die to impossible odds, or flub a button press, then you might be tempted to throw something. Resist, calm down, and get on with playing. The epic ending is SO WORTH IT. Much like the Matrix’s definition of deja vu, when your character, Eddie Riggs, is simply walking around the world, there are no loading screens. You only see those when something changes, such as a Mission starting. There are two kinds of Missions: Primary, which advances the linear storyline, and Secondary, in which you must complete a small task for Fire Tributes, the currency in the game, amusing dialogue, and in one particular questline, an axe upgrade. Most of your time is spent walking or driving around, killing bad guys, doing missions, or finding things, all for the purpose of getting Fire Tributes. There are more than 200 things to find in the world, with 120 of those being Bound Serpents. Every 10 Bound Serpents you find and free with a Pyro move, you get a significant number of FTs, and some kind of upgrade to your character. Upgrading or changing your car, ax, or guitar is done at one of the eleven Motor Forges, which you must find and unbury with the Relic Raiser solo, which is one of the Zelda: Ocarina of Time-ish mini-songs you must play as part of the rhythm game. In my experience, Motor Forges are also somewhat like Save Points. If you’re thinking of doing something risky, pop in and out of a Motor Forge, and you’ll respawn at the MT’s location, rather than all the way across the map. Otherwise, you’ll auto-save next to your last completed mission. Backstory and Worldbuilding is done through the Artifacts of Legend, which you must find and break free with an Earthshaker move. These are slightly easier to find, especially since the 10th one you find made this reviewer yell in rather loud surprise at the plot twist. The RTS(-ish) portion of the screen comes in a few varieties: Huge battles as part of the Storyline Mission, which you can tell are coming because everyone’s camped out near a few Fan Geysers; smaller battles as part of a Secondary Mission, which are differentiated only by how your character decides to deal out the death: either personally with axe, guitar, and disposable troops, with a lift jack holding your car and you sniping the enemy from above, with your car spotting for a cannon; or in a Multiplayer Game. There is a bit of internet controversy about the proper way to play these battles, either as pure RTS or as a lieutenant in the mix, but I’m going to wash my hands of it and tell you to play however the hell you want. In addition to using your car to drive around, execute jumps off a ramp for Fire Tributes, and running over or shooting enemies, there are also Secondary Missions in which you can race an overconfident and overweight demon for Fire Tributes. The waypoint system is slightly stupid, as if you miss one, you don’t progress to the next one, and you can’t win the race. So no shortcuts! The UI could use a little work. Your character doesn’t have anything like a giant flashy health bar or guitar cooldown meter, so when you’re close to death or can use your guitar’s special powers such as special attacks of Solos is not very apparent except for small visual clues: When you’re almost dead, the screen flashes red and the sound of your beating heart mutes everything else. When you can’t use your guitar, it turns red, and attempting to use it “burns your fingers,” coupled with a character animation, until it completely cools back down. Since your character stores the guitar behind him when not in use, if he is facing you, then you can’t barely see the relative redness of the guitar behind his broad shoulders. A day/night cycle is a good concept, but trying to find or see much of anything at night is an exercise in futility and frustration. Similarly during the portions of the game when the skies turn grey, red, green, or foggy blue. Sometimes it’s not clear what you’re supposed to do during a Mission, which is SOMETIMES hinted at by your NPCs shouting advice. Otherwise, you have to figure it out yourself. Sometimes I enjoyed it, other times I wish I had bought the strategy guide. Alright, the music. There is a LOT of AWESOME music in this game, and you can find two dozen more. However, you only gain access to the cool music from your car stereo. From there though, you can play, skip, and repeat songs, add and remove songs from your playlist, and shuffle them in different ways, such as by Allegiance, Artist, and a few others. The voice acting is believable and the puns and one-liners is great stuff. The character models and animations are pretty and expressive, as is the world itself, which is chock-full of such ridiculously-cool looking fauna and flora such as exhaust-pipe trees, scooter-boars, guillotine giraffes, emo-goth zombies, and General Lionwhyte, who flies around on his thick, luscious HAIR. I wasn’t a fan of Metal before, but this game converted me, except for a few songs, which thankfully, I could remove from the playlist. Except when I wasn’t in my car, in which case, I was stuck. Regardless of whether it was droolingly beautiful, jawdroppingly awesome, grotesquely ugly and horrifying, or a depressing desert or swamp, the environment was well done. The graphics and animation is well done, except for a few clipping issues. Lack of a well-designed UI, a driving system that was somewhat of a chore, lack of focus between RPG, RTS, or rhythm game, the necessity to explore in order to upgrade, and very little RTS support keeps this otherwise fun game from completely stinking me in. Multiple difficulties and the multiplayer support are pretty much the only thing extending it’s replayability, as you cannot otherwise repeat Missions in any way. 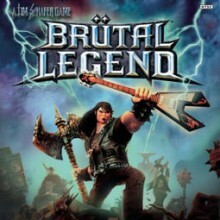 Unless you’re an old-school Metal fan, once the Brutal Legend Soundtrack comes out, the in-game soundtrack will be obsolete. One of the best weeks of my gaming life, except for when I felt like drowning myself in frustration and despair, like one of the Alliances you meet. Stay tuned next time, for when I review Borderlands!